HOW IS IT POSSIBLE THAT NO ONE HAS COMMENTED ON THIS MAP!? 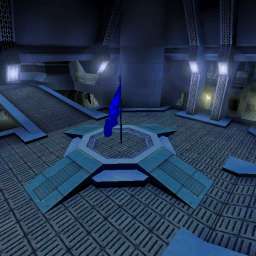 Although I question some of dmschameleon's DM maps, this CTF blew me away. The stunning visuals, good item placement, intricate layout, and great flow make this map one of the best I've played in a while. I especially like the 3 ways out, 2 ways in (while carrying the flag) setup in the bases. Also, the intricacy of the level is enough to be complex but still easy to learn. And, given the author, need I even bring up the sleek, compelling visuals? This map owns me! It looks pretty enough to send my computer into cardiac arrest.... Oh well. This is definitely Chameleon's best, and I really love the theme of this place too. Great flow, and one of my new favorites. It's a bit laggy in some spots, but I guess that's just because my computer is rubbish. very nicely done i think maps like this should be on more servers.. I really enjoyed this map. I loved everything about it. The shiny surfaces, the intricuit layout and the lighting that screams "Hey! You're in the Blue Base moron!". That helps alot because this map is HUGE. I'm talking GARGANTUAN. The multiple entries into the bases make for a great twist of strategy not just "run around and blast the bejeezus out of everyone" gameplay, although that's good too. Why not a ten? Well, being a big map, it takes some navigational skills that I lack. I found myself asking "Now where is the flag agian?". Also, it lagged a bit on my computer but that's just because it's crap. This map wasn't made all by himself. Lecter helped him, I think this is a great map, too, great work, but my pc doesn't stand it. Map is good, with spectecular architecture but its kind of complicated, and the textures are used over and over in the level. lighting is fine and weapon placement too. I don't play CTF but when I saw the screen shots I had to dwnload to get a looksie. And I'm glad I did. I liked your idea with the mesh windows, I'm Implementing that Idea in my current project. Making meshes is actually pretty easy. The architecture is outstanding, but the gameplay is nothing special. Good map, indeed. It deserves a decent review. I guess it isn�t very popular because at first look it looks dark, confusing and laggy at places, especially in the middle area. It gets interesting only when you learn the layout. I spent the first ten minutes running in the corridors around my flag trying to figure out how can I reach the main action area in less than half a minute, while the enemy made score after score. The good thing, however, is that if you get cornered in the enemy base you can lose the chasing mob very easy.